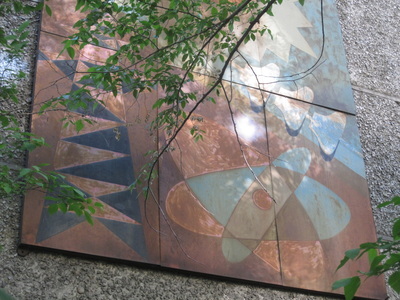 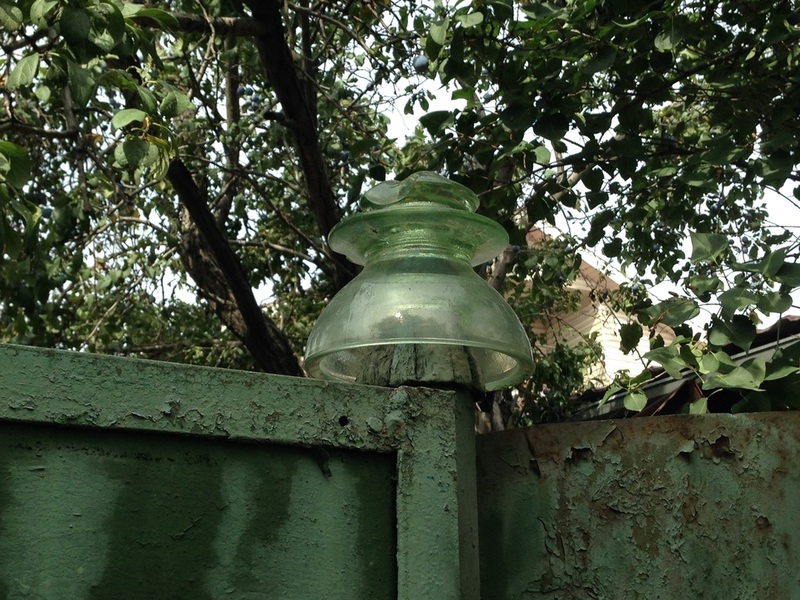 The urban landscape is full of beautiful objects that few people care to notice, and the insulator [изолятор; izolyator] must be the most undeserving of its obscurity. Imagine a bell with graceful curves, made of dazzling porcelain or sturdy green glass. An interior designer might find it a lovely piece for a table setting or a china cabinet. 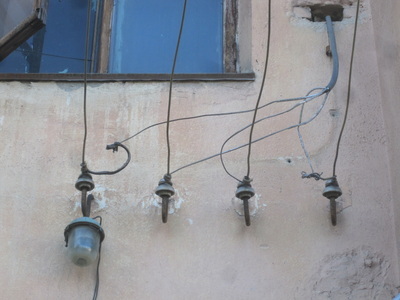 Yet these delicate bulbs are planted on buildings across Almaty by the thousands, posted also in large arrays on telephone poles, only to be overlooked as nothing more than a utilitarian object. 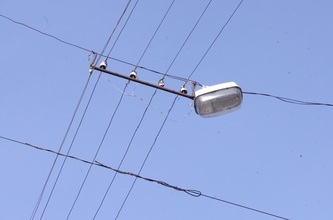 If you can open your eyes a certain way, you can be taken in my their charm. 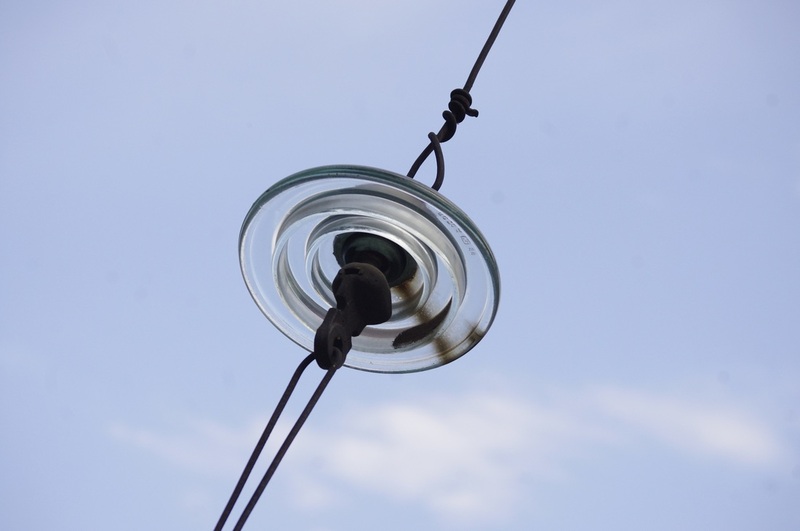 I was so dorkily pleased to discover that there is a whole subculture in America of people who obsessively collect and document the history of insulators. 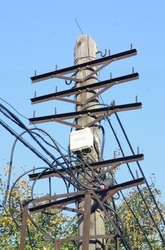 It feels good to know that at least somebody can dig my imagery; their newsletter is called "Crown Jewels of the Wire." 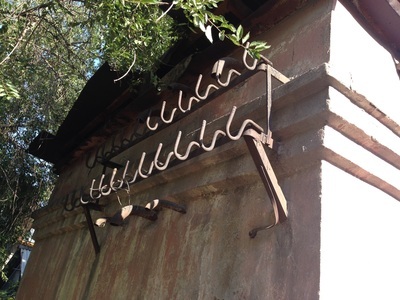 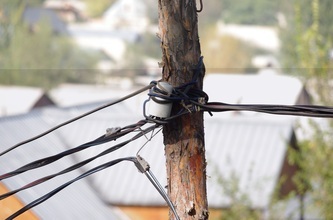 They've developed a whole page of jargon to describe these objects: the "wire groove" where the electricity cable gets wrapped, the "skirt" that slopes out from below, the "crown" that grows narrows above. 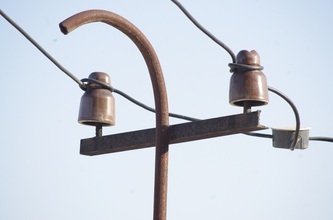 Learning these terms, I was soon able to identify that many Soviet insulators have a "saddle groove" on top, and I realized that most insulators you spy here are of a certain type: porcelain pin insulators. 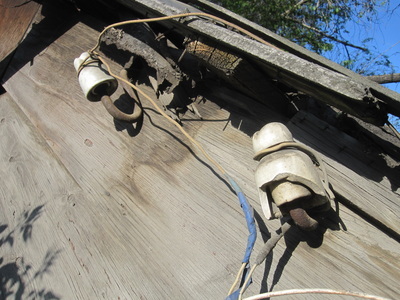 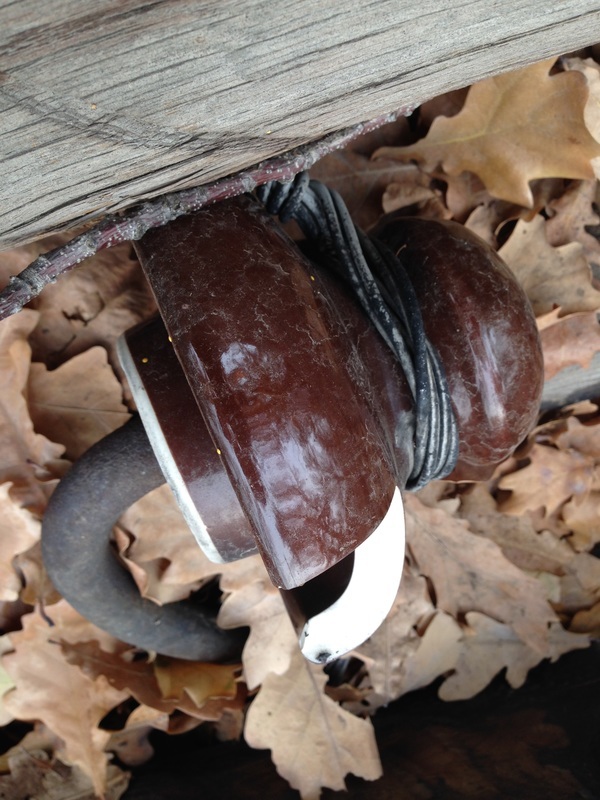 Insulators, I should explain, are meant to isolate a dangerously-charged wire from its physical support. 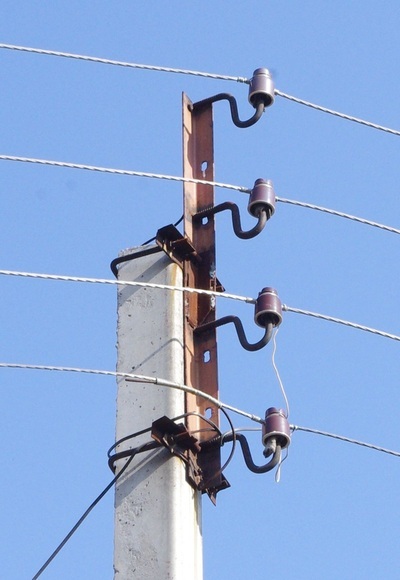 In the States, these insulators are often found lined up on telephone poles, on a plank perpendicular to the pole called the "cross arm". 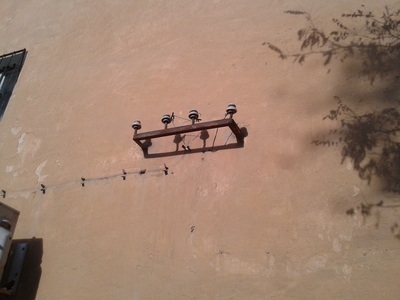 On the cross arm is a row of screws that the insulators are screwed onto. These screws are the "pins" that give this insulator its name. 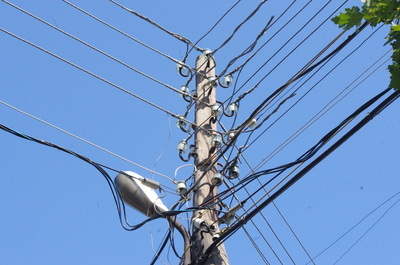 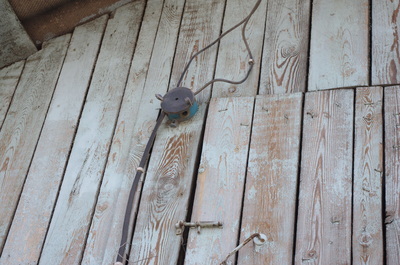 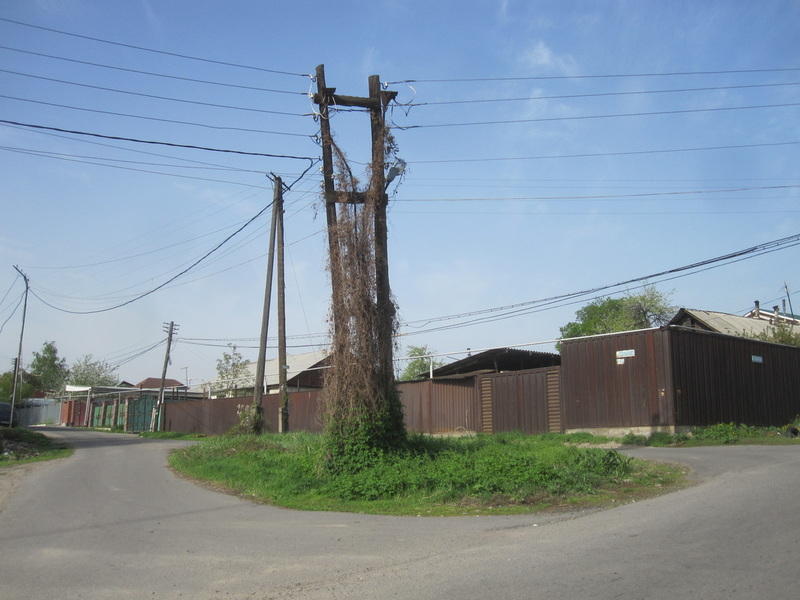 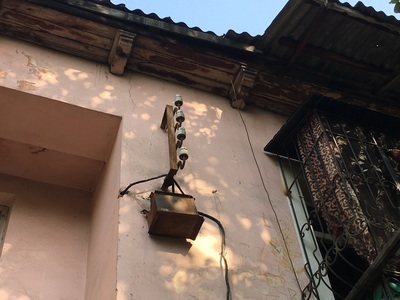 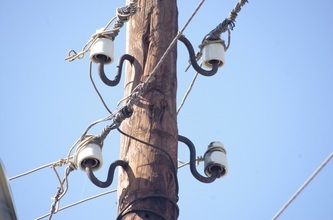 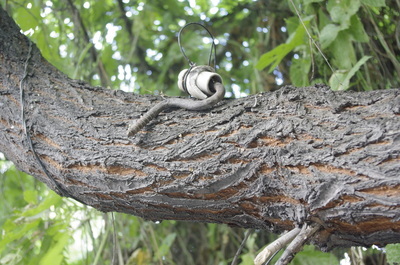 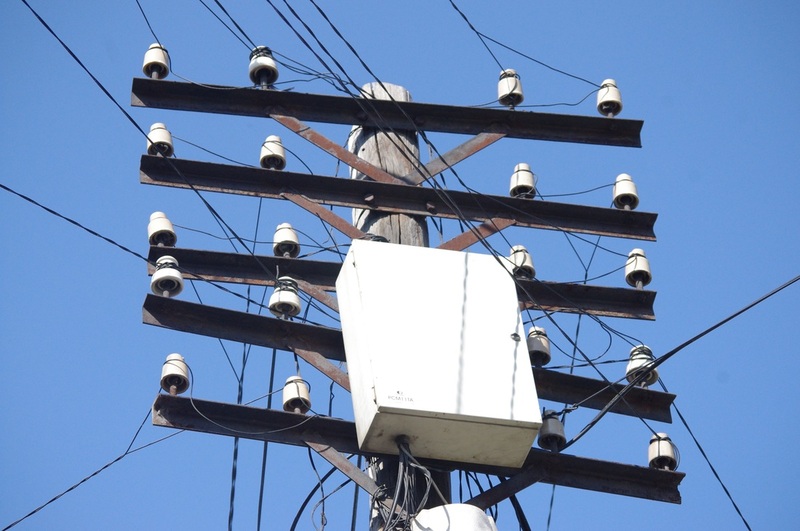 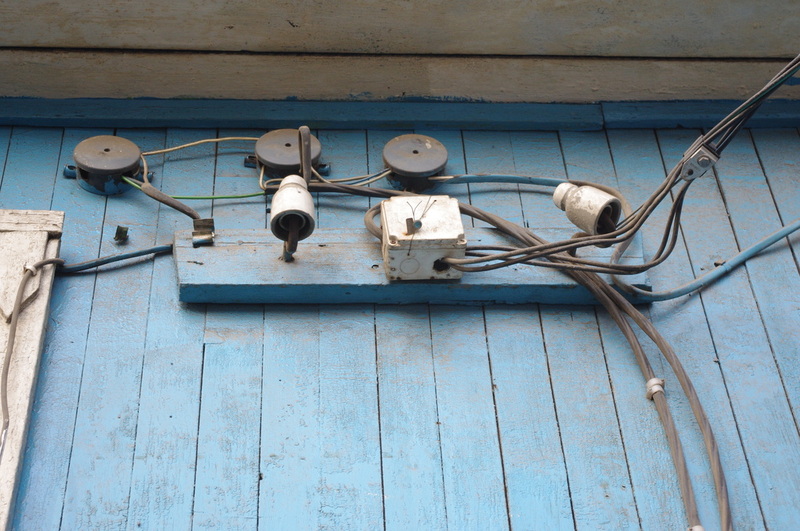 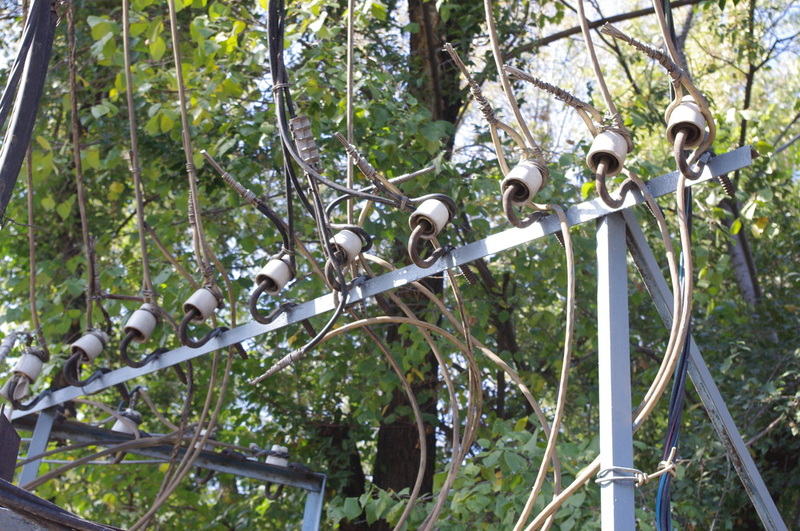 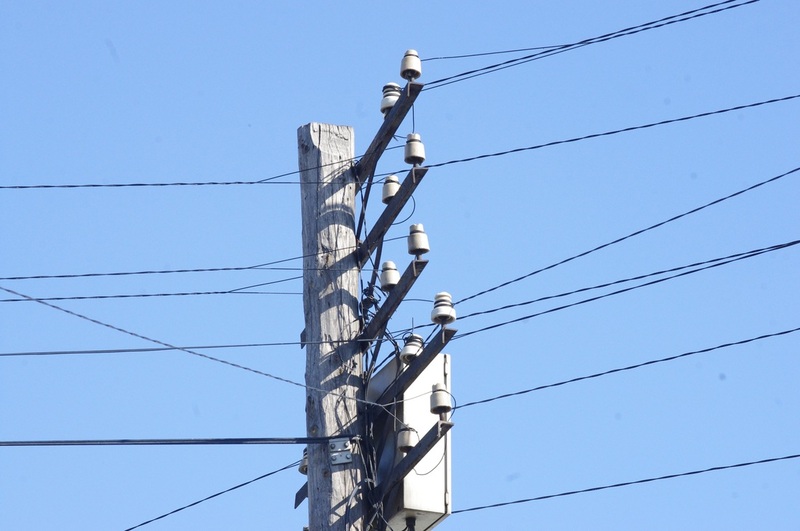 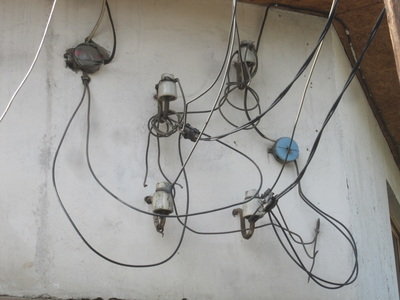 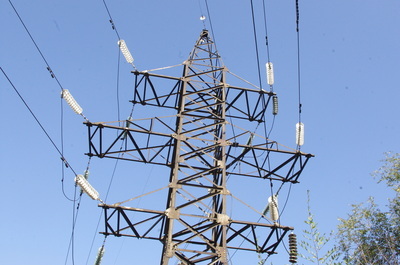 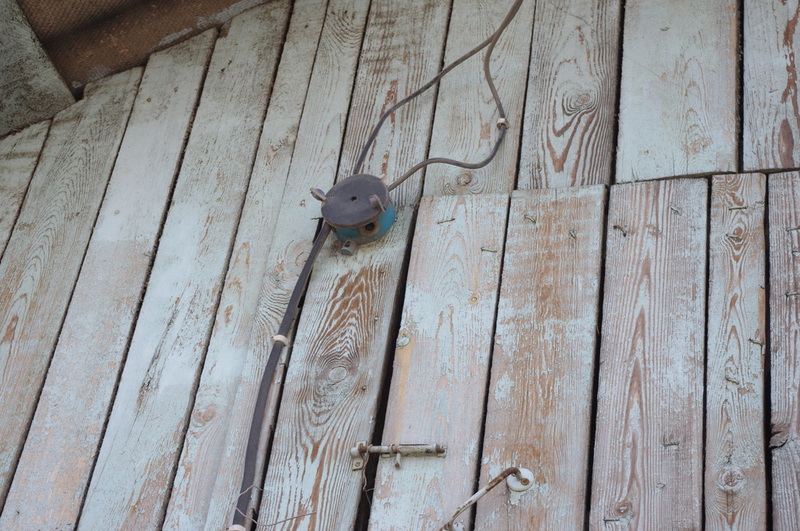 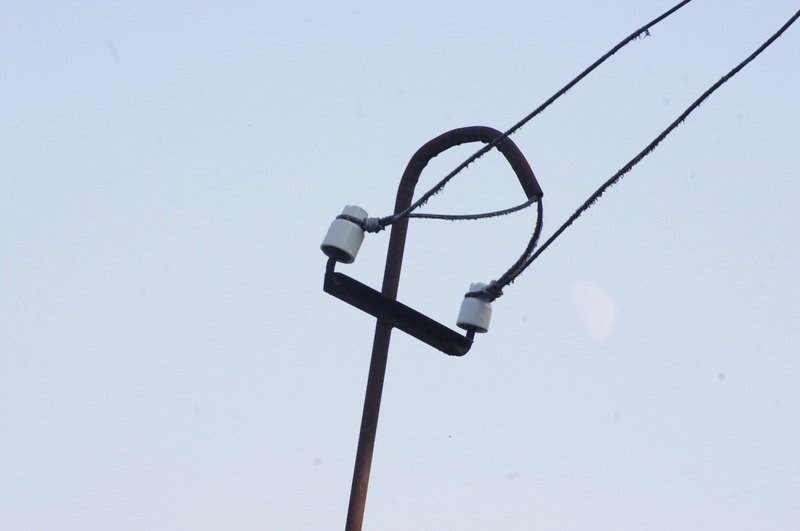 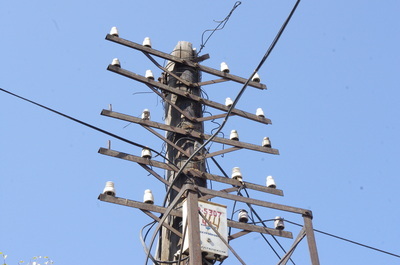 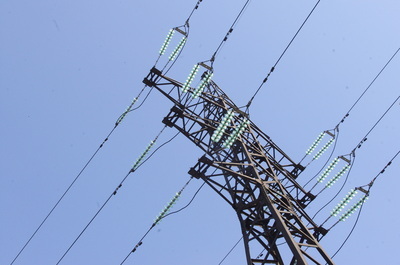 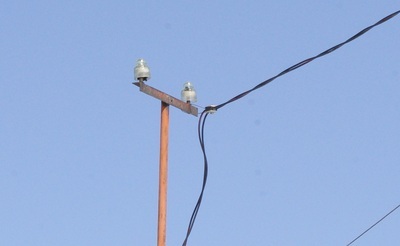 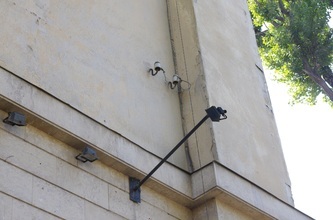 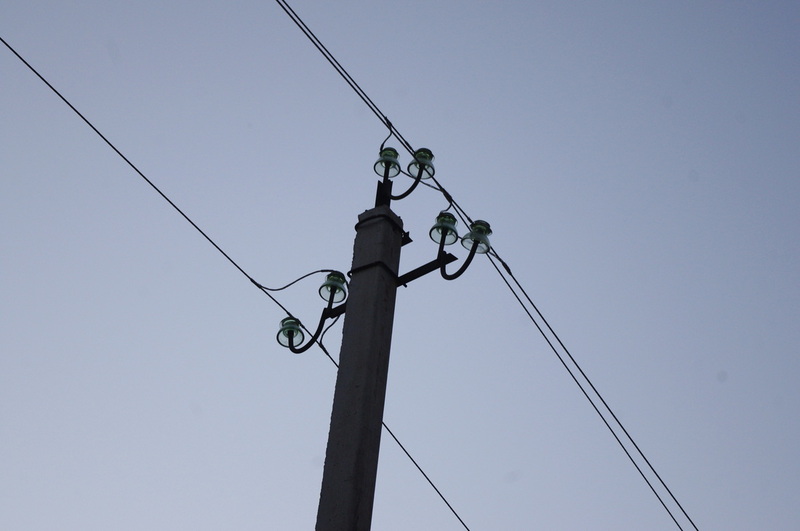 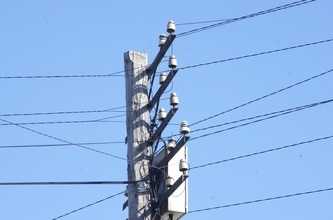 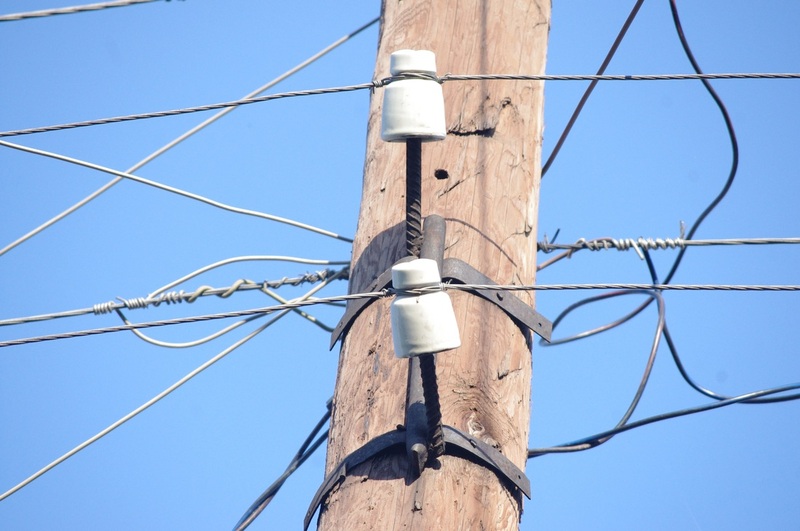 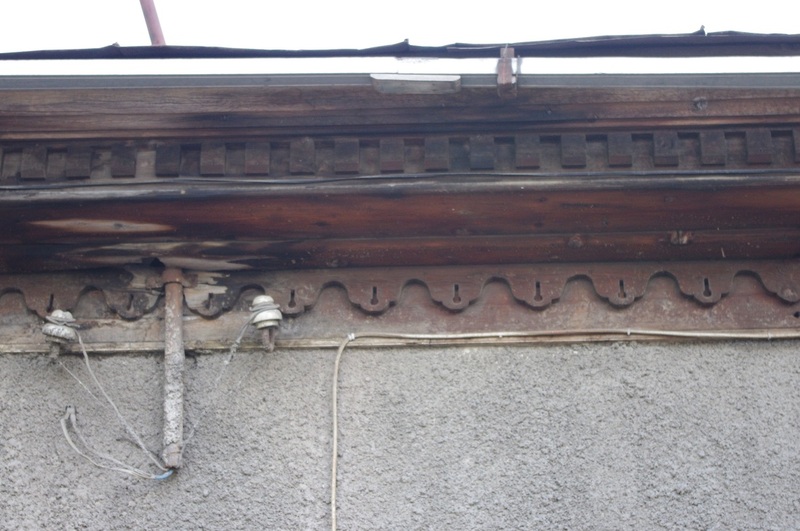 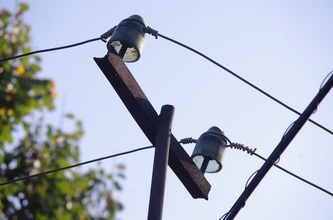 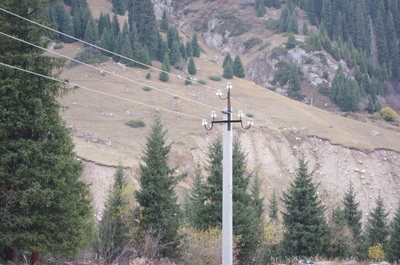 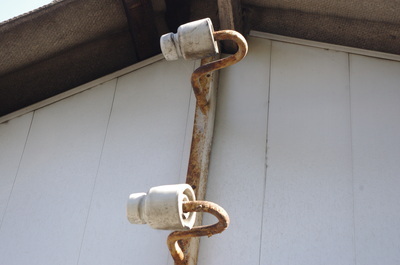 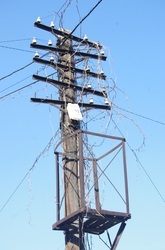 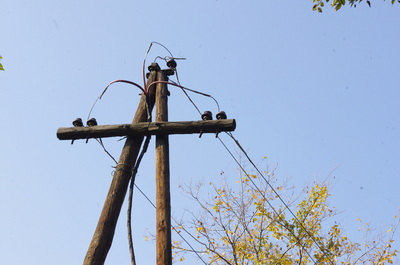 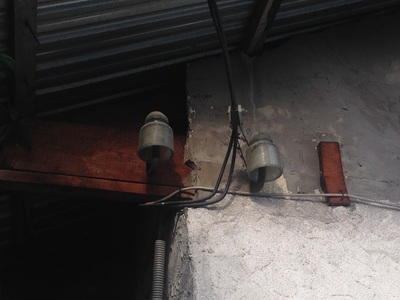 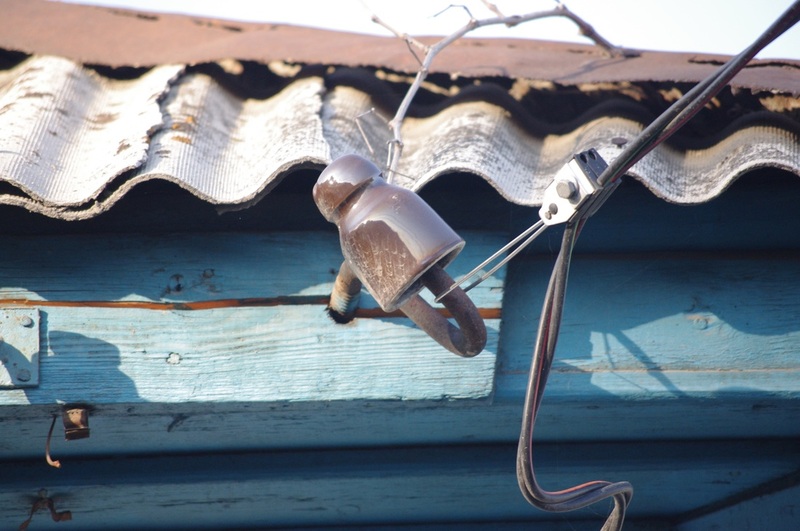 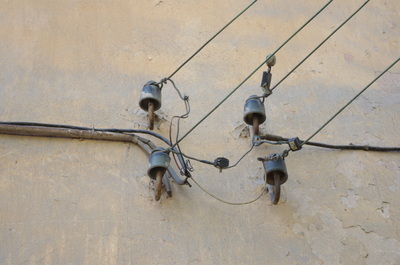 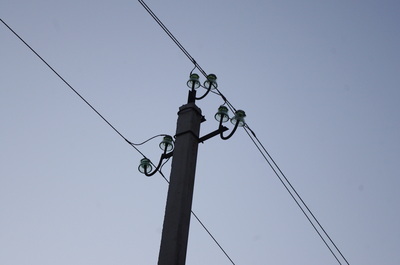 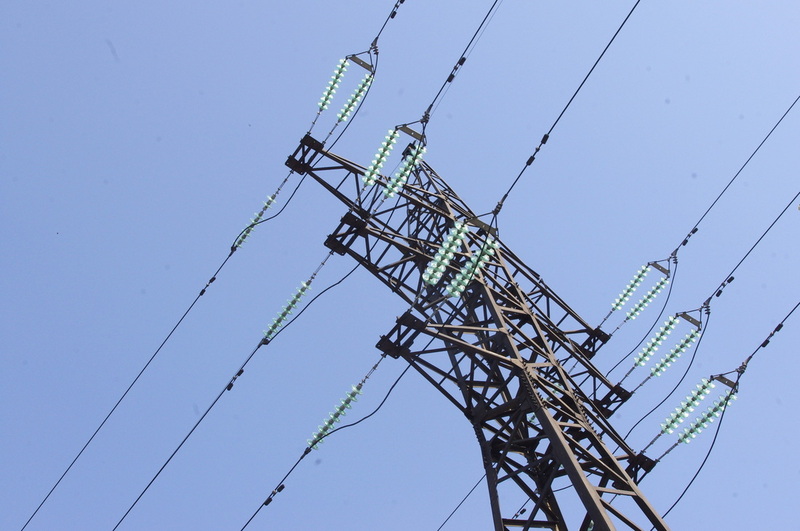 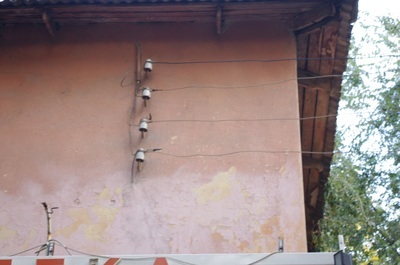 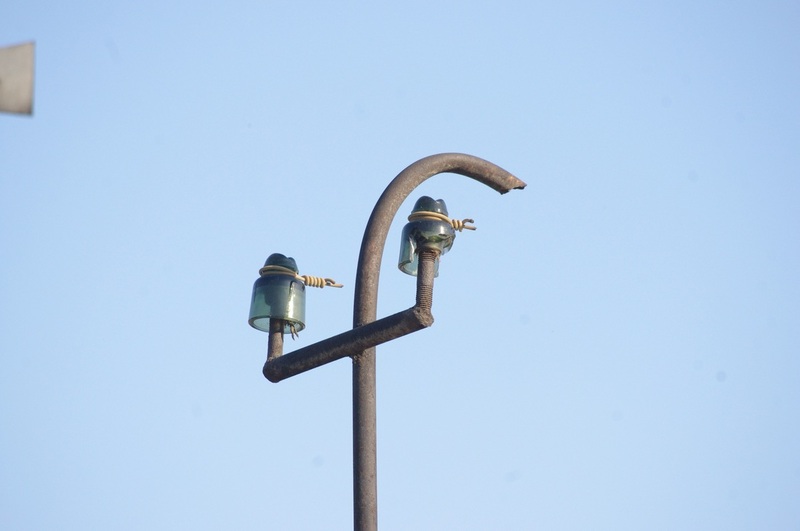 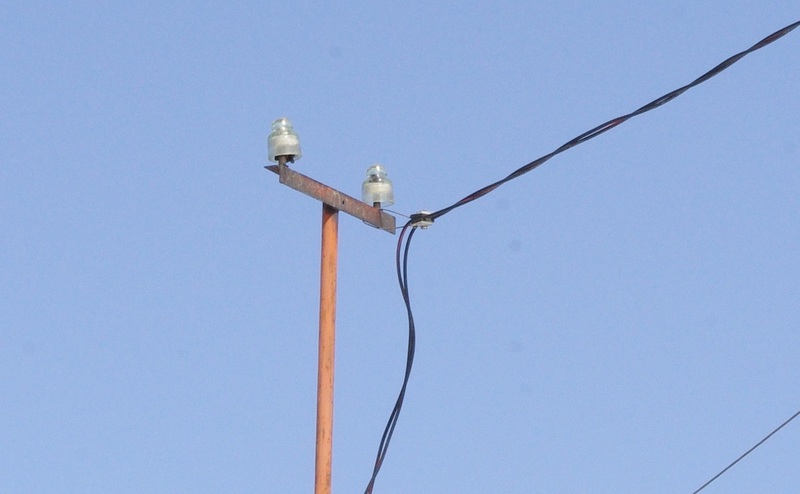 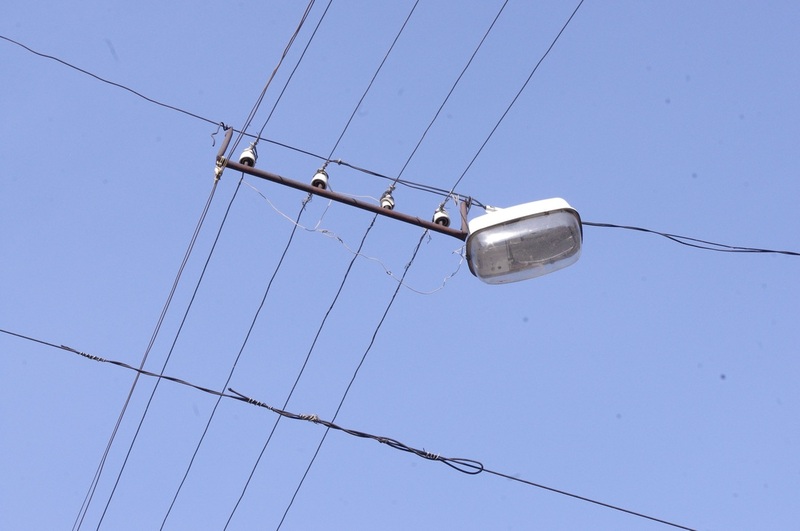 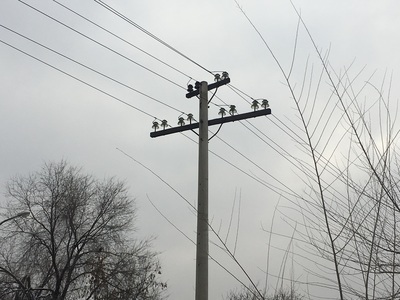 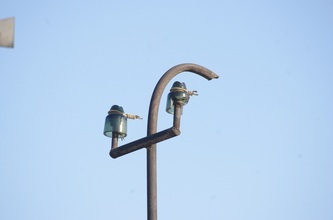 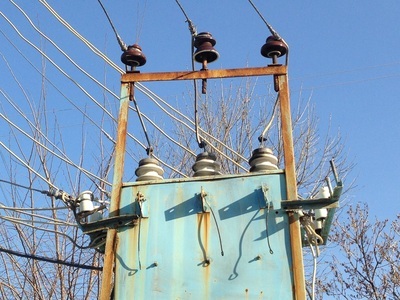 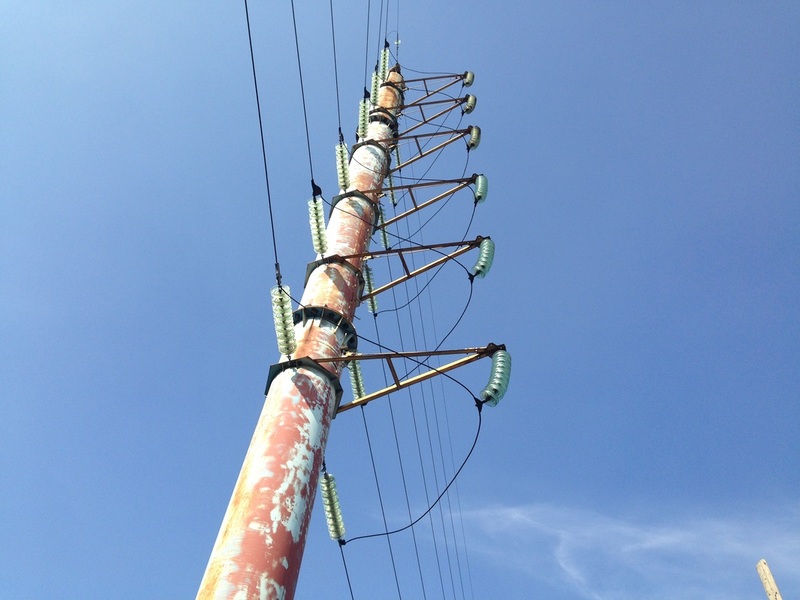 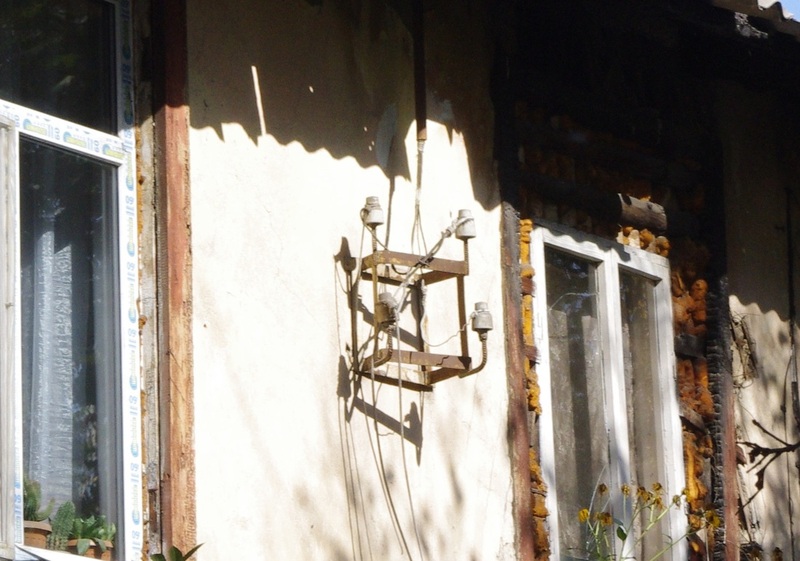 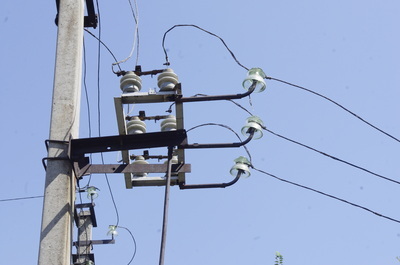 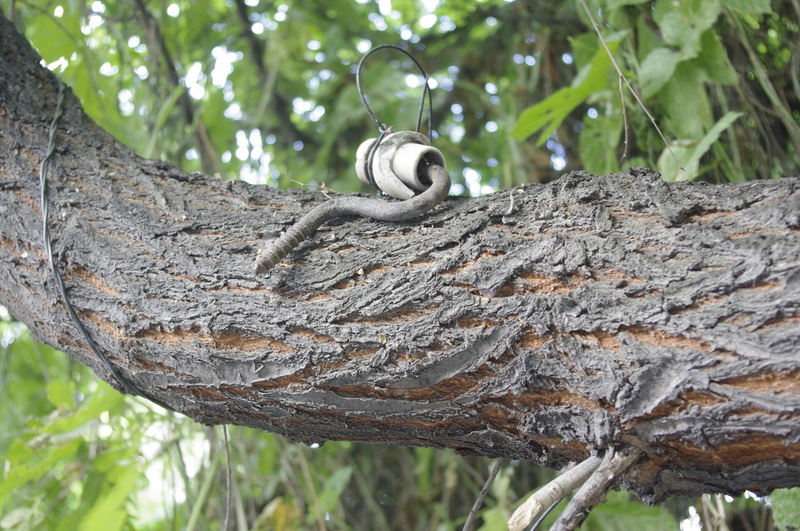 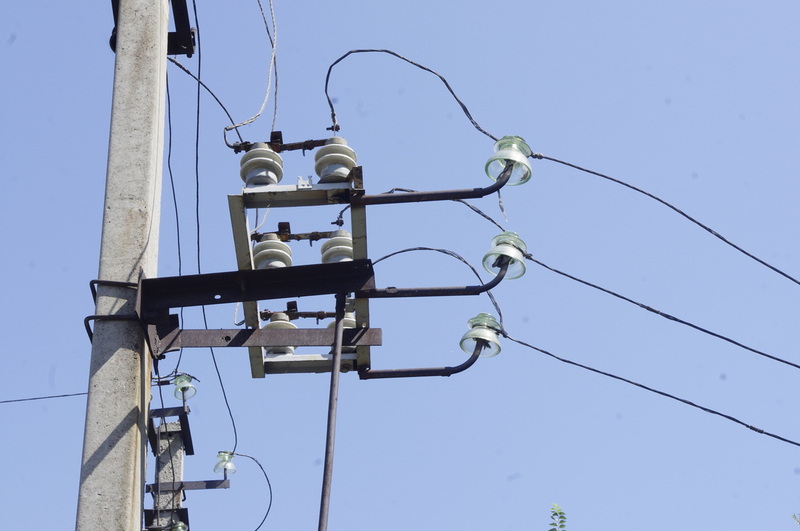 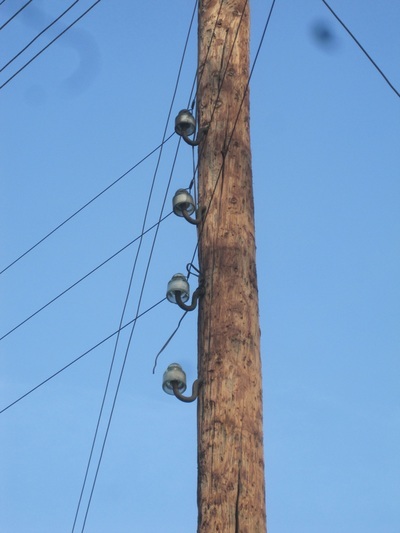 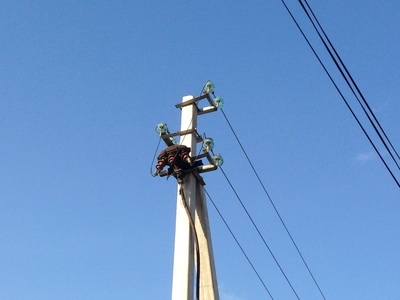 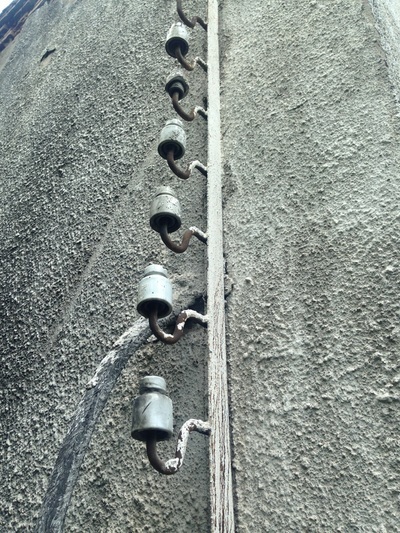 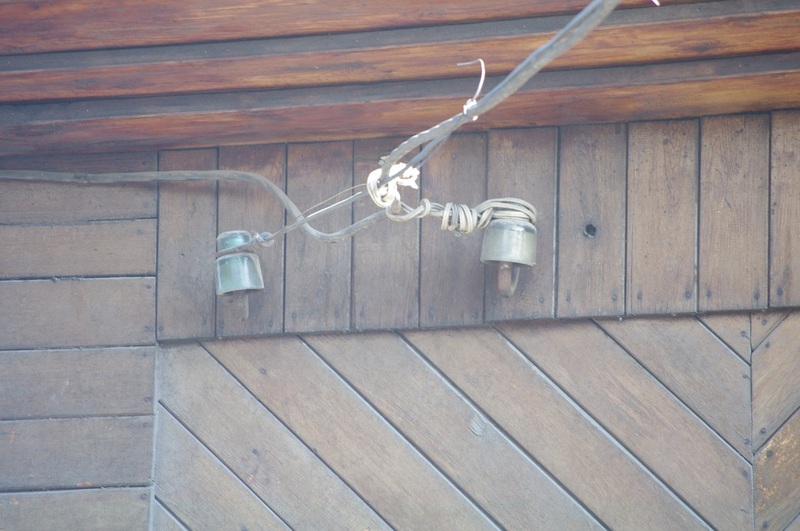 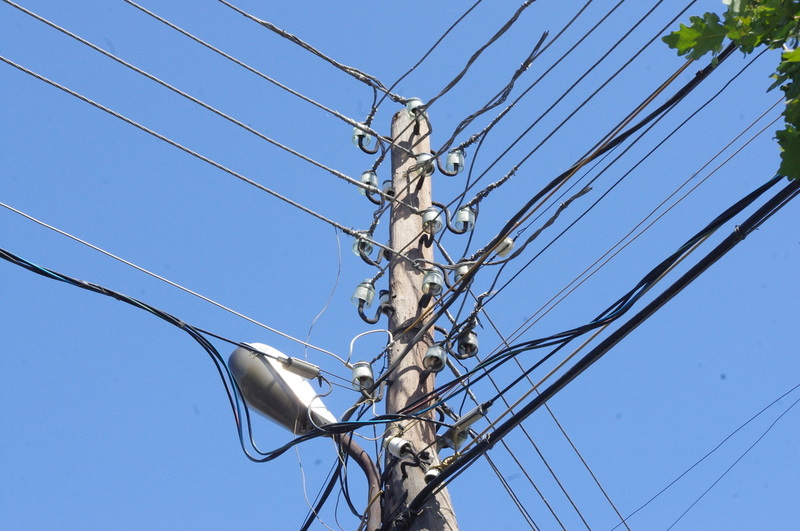 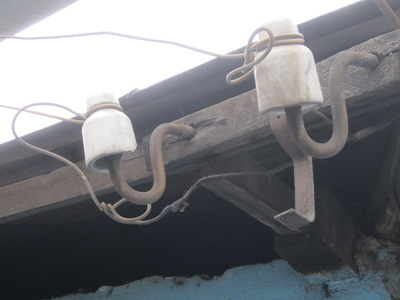 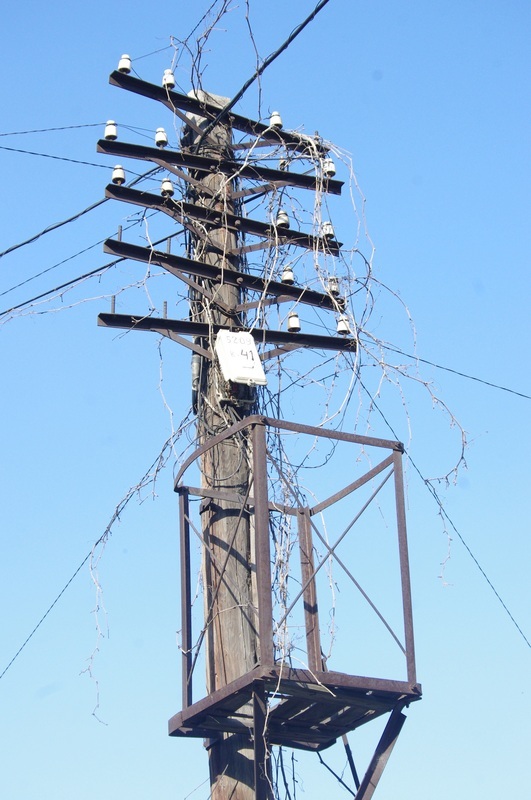 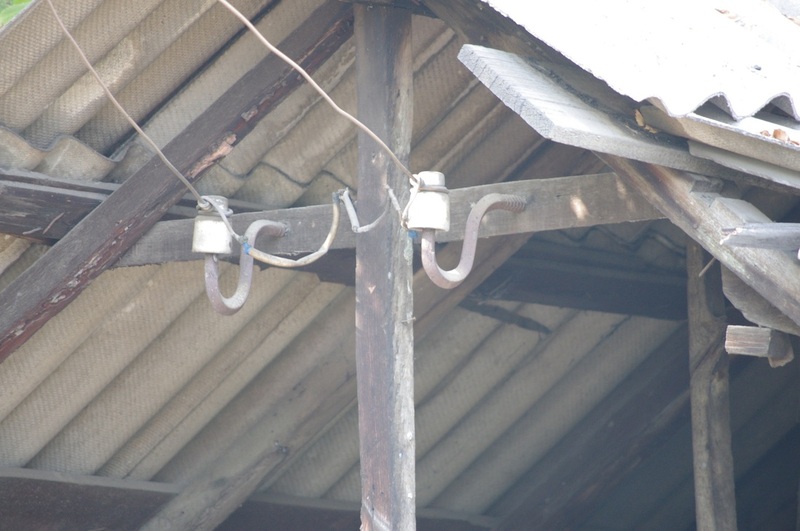 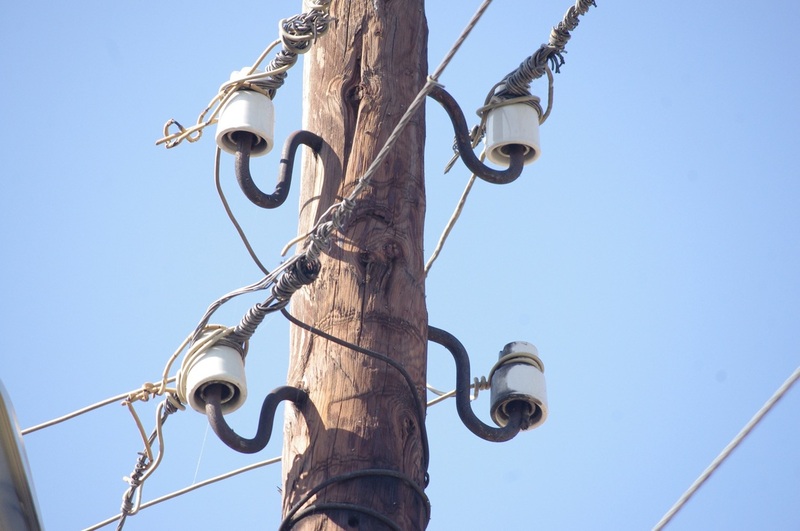 In Almaty you can also see these lines of pins and insulators high up telephone poles, but here insulators are more commonly found on hooks [крючки; kryuchky] that screw into telephone poles themselves, or screw into the sides of private homes and Soviet apartment blocks. On homes, you often see the wires going into circular cases after attaching to the insulator; these are called junction boxes. 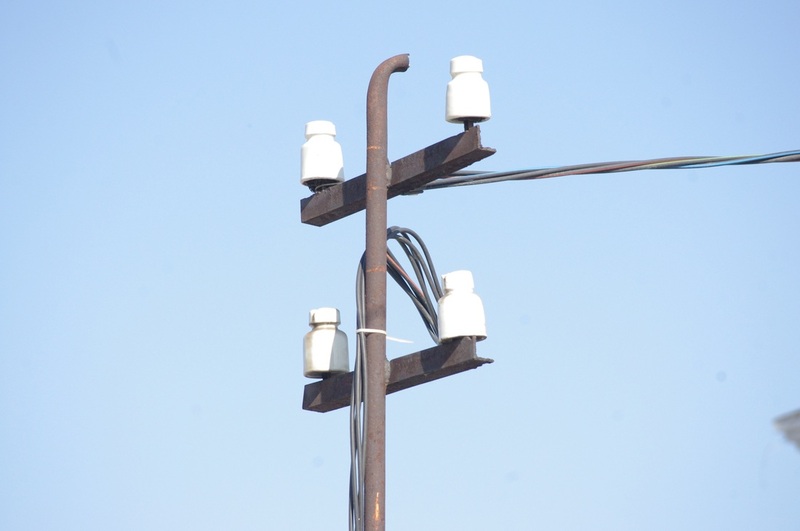 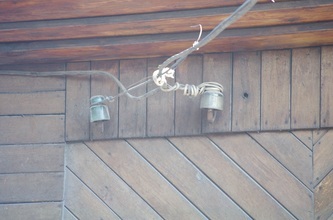 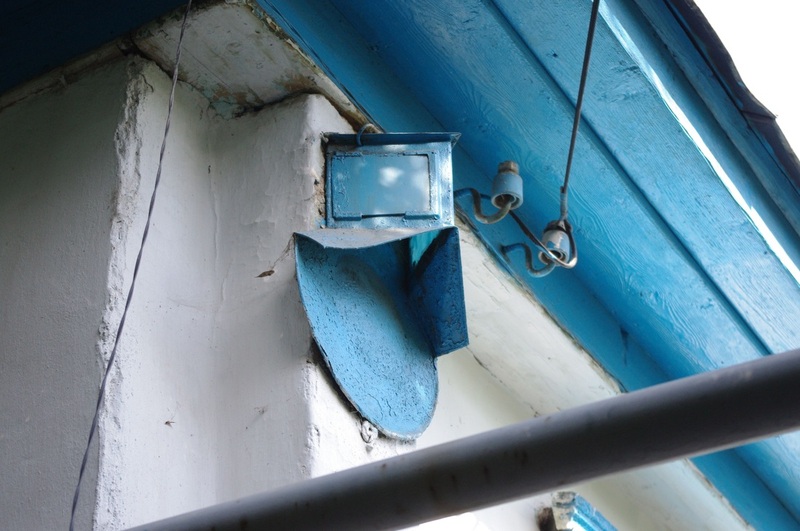 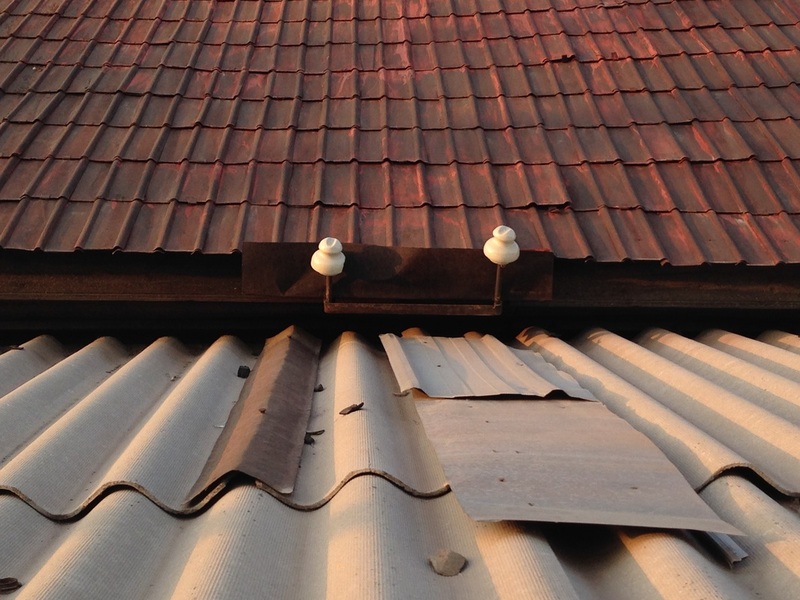 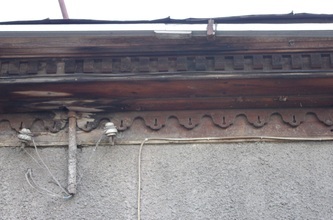 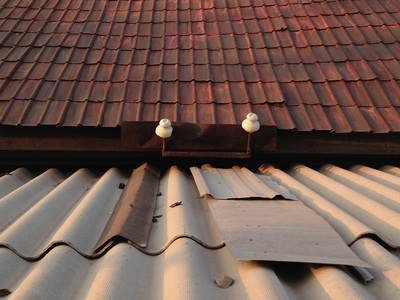 The pin insulators in Almaty are overwhelmingly porcelain, and usually white. 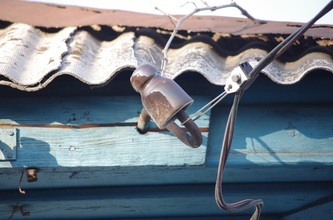 I've also seen brown porcelain quite a bit, and black ones too. 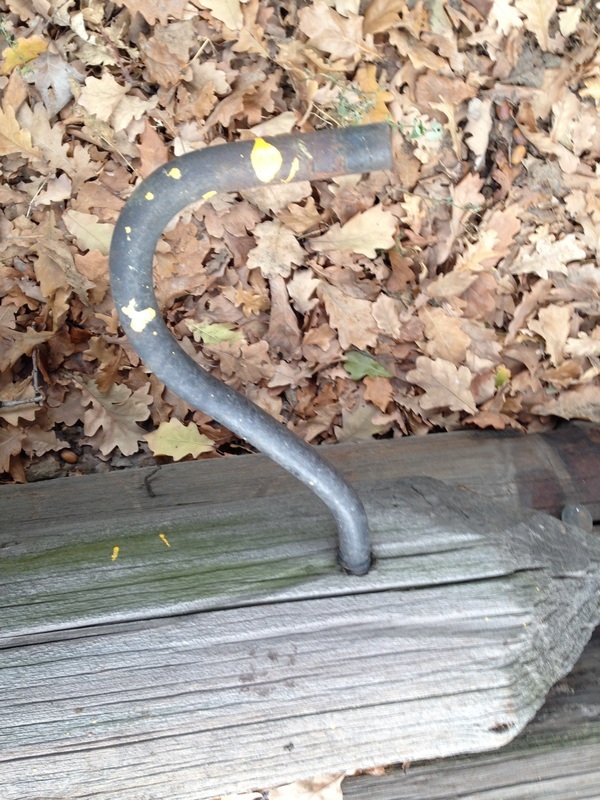 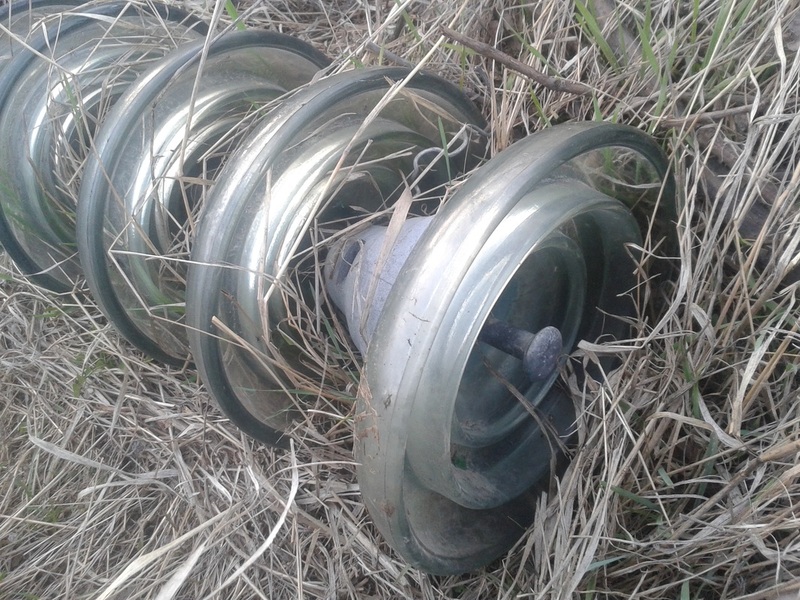 Glass pin insulators are the most exciting to spot, as they are renowned for their beauty. It is these insulators, after all, that are collected most intensively by Americans, but alas, Kazakhstan doesn't sport the bizarre shapes and purple-and-orange varieties that you can find back home. Glass insulators do proliferate, however, on the high-voltage transmission lines that run through the more industrial parts of town. Here, you can see strings of what are called cap-and-pin insulators, big glass plates that are stacked together like crystal flapjacks. 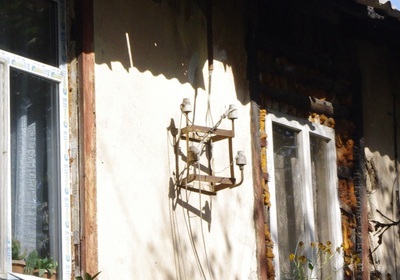 As the electrical system in Kazakhstan becomes more sophisticated, porcelain and glass insulators will become more of a historic curiosity, perhaps breeding collectors and conventions as people try to preserve the past. 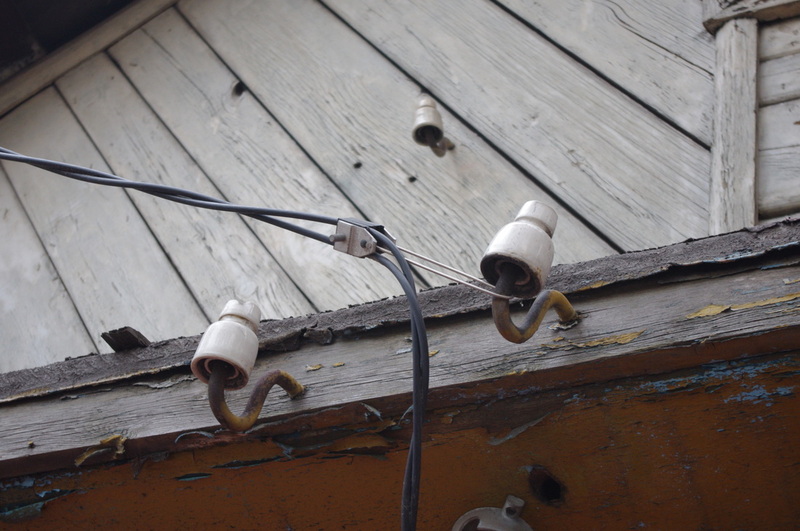 Already, I've seen them featured on a Soviet nostalgia site with a feature called "Do You Remember? 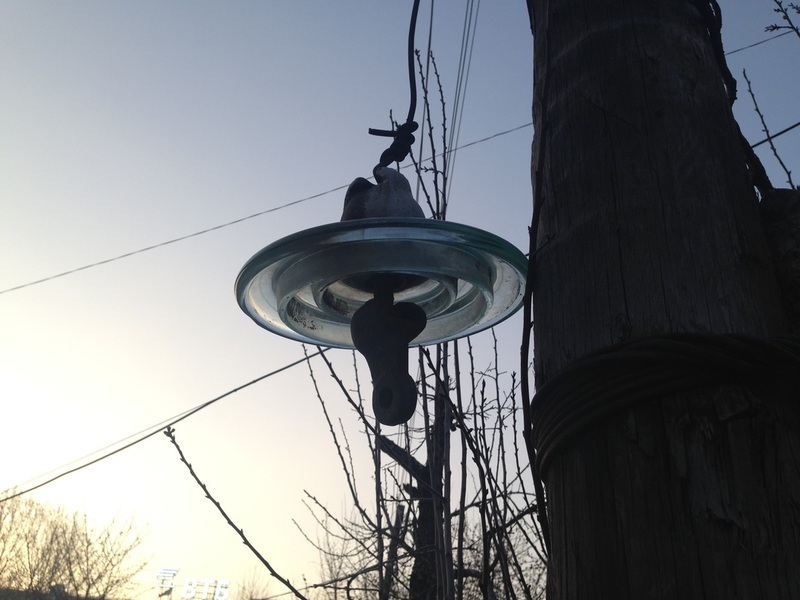 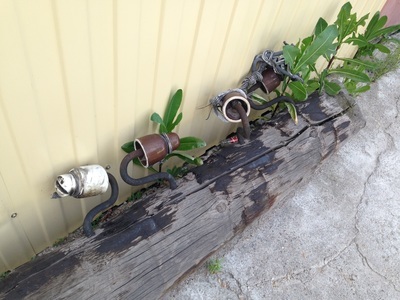 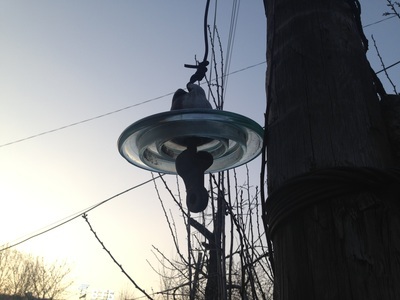 ", an older reader posting a picture of green porcelain insulators from her childhood. 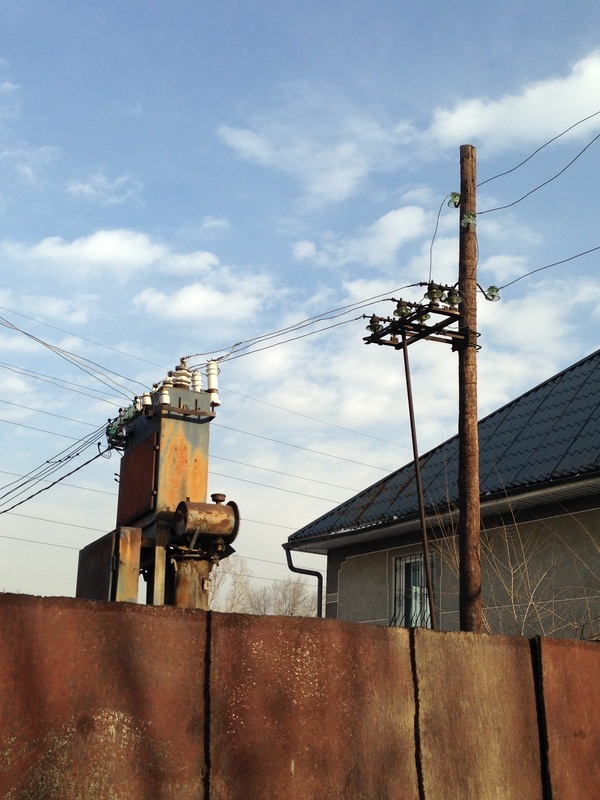 In Kazakhstan, they are still being molded at a factory in Ust-Kamenogorsk, an operation that also makes porcelain dolls. 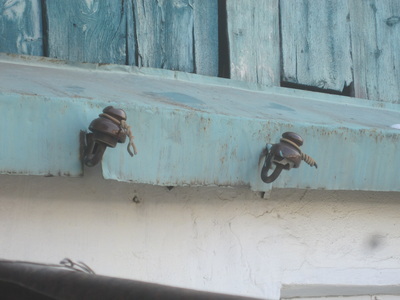 It's a nice reminder that these are not just artefacts but sculptures that continue to be made every day, side-by-side with trinkets for the mantle. They are one and the same, the insulators just trinkets for the wires above.